EDGE allows users to load a "Project Configuration" and choose from a list of multiple configurations with just one EDGE instance. EDGE can collect a variety of data through its library of forms/tabs. There may be scenarios where EDGE will be used for a number of different projects that have conflicting requirements on how EDGE should be configured (e.g., which forms are visible, field defaults, required fields, etc.). The Projects feature allows for the storage of any number of distinct sets of configuration files (in .\EDGE\Projects), among which EDGE can switch at the user’s request. EDGE copies the configuration files from the selected Project into the appropriate locations in the main EDGE directory. This allows EDGE to quickly load these configuration files so that the desired tabs/forms are visible, settings are enabled, field defaults and settings are activated, etc. 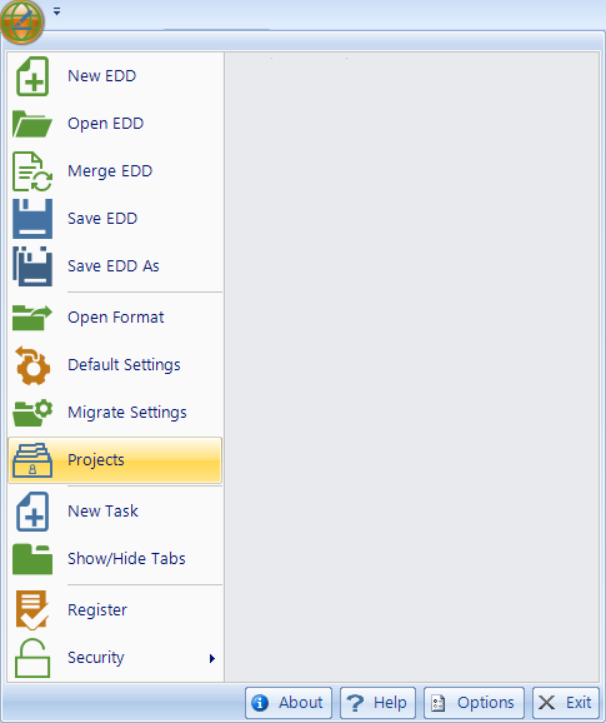 To open the project manager window, select Projects from the EDGE Application Menu. Available projects are displayed in the project manager window. Select the desired project. Double click on the selection to load the project into EDGE. If a different project was already selected, a warning dialog box will ask for confirmation to switch to the new project. Click Yes. 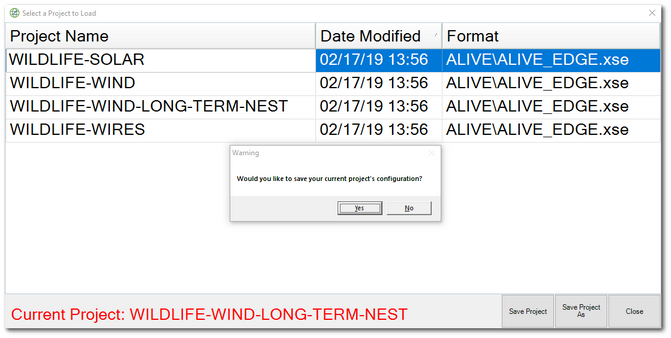 When switching from one project to another project, a dialog box will ask if the configuration of the current project should be saved. Select the desired option: Yes or No. The user may be prompted to select a format to open the selected project. Upon selecting the desired format, EDGE will reopen and the current project will show in the bottom right corner of the EDGE window. Any security settings associated with a specific project are dynamically loaded when a project is selected. To apply security setting to a project, select Security from the Application Menu. For information about configuring security settings, refer to the Configuration Security article. It is imperative to Save a project after making security changes or the changes will be lost when switching projects. 2.Make configuration changes as desired, including general EDGE Options, form layout options, and options available through the Configuration Plugin Tool. 3.Click the EDGE Application Menu> Projects. 4.Click Save Project. To save a new copy of the Project, click Save Project As. Projects may be configured by an EDGE administrator prior to distributing the configured EDGE file to users. If this is done, there remains one setup step for each end user: point each Project to the correct format file (e.g., .\EDGE\Formats\EDGE\EDGE.xse) on the local computer. 1.Click the EDGE Application Menu > Projects. 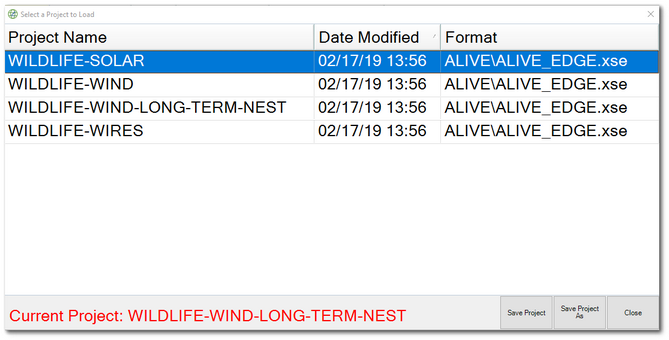 2.Hover the cursor over a Project row's Format column to find a white rectangle on the right. 4.Browse to the format file when prompted.